Synopsis (adapted from the publisher's website): Midnight Gulch used to be a magical place, a town where people could sing up thunderstorms and dance up sunflowers. But that was long ago, before a curse drove the magic away. Twelve-year-old Felicity knows all about things like that; her nomadic mother is cursed with a wandering heart. But when she arrives in Midnight Gulch, Felicity thinks her luck's about to change. A "word collector," Felicity sees words everywhere, but Midnight Gulch is the first place she's ever seen the word "home." And then there's Jonah, a mysterious, spiky-haired do-gooder who shimmers with words Felicity's never seen before, words that make Felicity's heart beat a little faster. Why I recommend it: Natalie Lloyd's spindiddly way with words! If I didn't know better, I'd think I was reading a cross between Roald Dahl and Dr. Seuss, with a generous helping of made-up words along with a heaping portion of real words that are both scrumptious and colorful. The quirky characters and marvelous setting are further reasons to fall in love with this imaginative novel. I wish Blackberry Sunrise ice cream really existed (eating it helps you remember). And I wish I had this much imagination. Bonus: I appreciate that Jonah is in a wheelchair but the author doesn't make a big deal out of it. It's simply the way Jonah is. 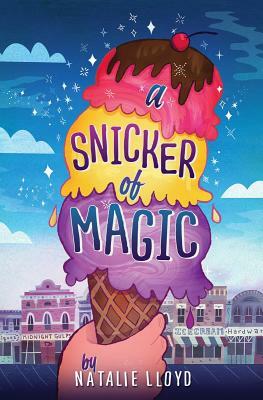 Have you read A Snicker of Magic? What did you think? Why I recommend it: If you looked up "delectable" in the dictionary, this book could be the illustration. Also, "hilarious" and "imaginative" (I love that she lives in East Dumpsford, New York!). I wish Gladys was a real food critic, awarding four stars to classy restaurants. Her reviews would be so much more fun to read. Reading this book will make you so hungry you'll want to whip up a frothy dessert and gobble it all down. And even though I found the parents a little over-the-top (they actually prefer microwaved meals? Ugh! ), it's all in good fun and you'll find yourself rooting for Gladys. Give this adorable book to the young foodie in your life. Have you read any sweet and funny middle grade novels about food? Congratulations to the winners of the ALA Youth Media Awards, announced this morning in Chicago! Hope your favorite book wins an award. I'm posting this ahead of time, so I don't know who the winners are yet. I'll be following the live webcast at 9:00 am EST (8:00 am Central time). Regardless of whether or not it wins an award today (Schneider Family Award, maybe? 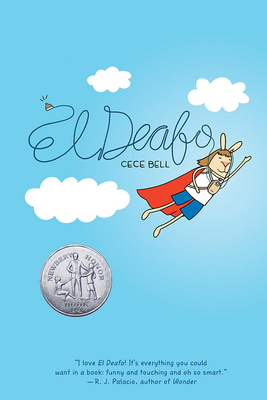 ), I wholeheartedly recommend El Deafo by Cece Bell. My writer friend Ilene Wong (who writes as I.W. Gregorio and whose groundbreaking YA debut novel None of the Above pubs on April 7th!) suggested Cece Bell's graphic novel to me when we were browsing at Aaron's Books in Lititz, PA (such a fun bookstore). I'm so glad she did because I really loved this book. I have to admit, at first I put off reading it because the artwork didn't really appeal to me (yes, the characters are all rabbits), but when I finally sat down and started reading, I couldn't stop. El Deafo is actually a powerful memoir in graphic novel form. 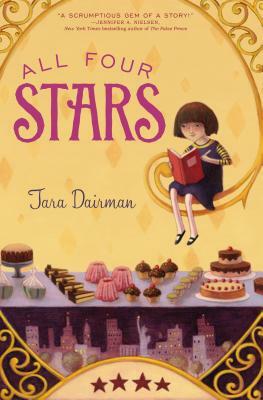 Touching and warm and always very funny, the book shows us Cece's life as a kid with hearing loss who's just trying to get along in a hearing world. She learns to lip-read, aided by her Phonic Ear. It's the Phonic Ear that turns Cece into a superhero, when it proves to be so powerful she can hear what the teachers are saying in the teacher's lounge. A terrific book for any kid who ever worried about being different. What books about disabilities have you read?